Read about ButterflyCircle's conservation efforts to save the Harlequin (Taxila haquinus haquinus) - a pretty little Riodinid, when its habitat is about to be destroyed for future development. After being absent from the main Island of Singapore for almost 20 years , The Harlequin (Taxila haquinus haquinus) was rediscovered in Apr 06. It was previously only known from Pulau Tekong, an offshore military-controlled island to the north-east of Singapore island. This species of the Riodinidae tends to prefer heavily shaded localities where its host plant can be found. The adult butterfly flits from leaf to leaf, generally at low level bushes, often with half-opened wings. Where it was discovered on the main island was in an area which was not a gazetted nature reserve and hence was not protected from future development. After about a year of monitoring the site, a colony of the species was found to be thriving in that locality. However, the butterflies remained within the vicinity of a very small area, rarely venturing out more than 100m away from its main zone of preference. 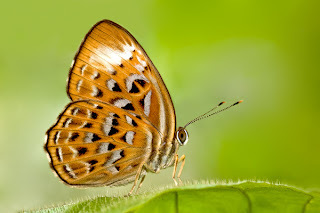 Due to the small numbers and localised nature of this butterfly, ButterflyCircle prepared a conservation plan to relocate/propagate the butterfly should its habitat be destroyed. 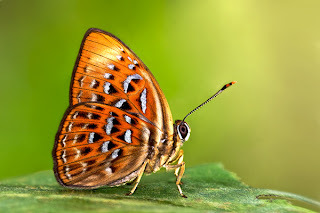 Its hostplant was subsequently identified and the life cycle of the species from eggs to adult butterfly was recorded. Since the rediscovery, regular visits were conducted to monitor the colony and study its habitat to understand this species better. Suitable sites with similar hostplants were scouted and surveyed for the relocation plan. An experimental batch of the adults was relocated on June 07, however for some reason they did not produce any offspring at the relocated site. 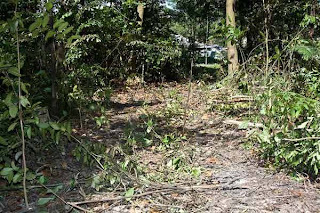 Photos showing site clearance at the Harlequin habitat. 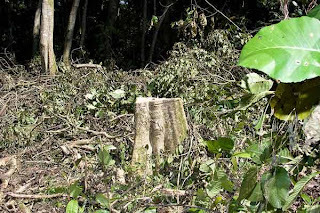 Trees were chopped down and the area cleared of low vegetation. Clearly, the site was being destroyed and the Harlequins were in danger of losing their preferred habitat. Some time in Oct 07, members of ButterflyCircle discovered the clearance of the Harlequin site by some contractors. With the imminent destruction of their habitat, it prompted us to launch our immediate action plan to save the species. The plan entails conserving the species by breeding and translocating them to suitable sites for their continued survival. Moreover, the species does not appear to be a nectar feeder, and they are often observed feeding on microscopic substances on leaf surfaces. Nevertheless, after close observation and some trials , a formula for feeding the adults was established and that keep them happy and alive. In return they rewarded us with a number of eggs. The first batch of about 80 Harlequin caterpillars were nurtured by ButterflyCircle members . A local environmentally-friendly organisation was also roped in to collaborate with ButterflyCircle in this conservation project and supplied with a batch of eggs as an alternative breeding source.